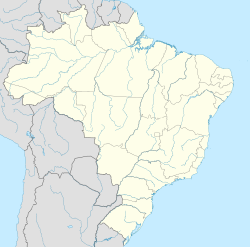 Irecê is a municipality in Bahia, Brazil. As of 2012[update] it had a population of 62,527 people. 476 kilometres (296 mi) by road northwest of Salvador. It is an agricultural town known for growing black beans and being a wine-producing region. It is the home of the "Academia Ireceense de Letras e Artes." It was also the site the Universal Church of the Kingdom of God chose for an industrial kibbutz. ^ Mitchell, Simon (1 January 1981). The Logic of Poverty: The Case of the Brazilian Northeast. Routledge. p. 24. ISBN 978-0-7100-0637-0. Retrieved 12 June 2013. ^ Meyer, Birgit; Moors, Annelies (1 December 2005). Religion, Media, and the Public Sphere. Indiana University Press. p. 65. ISBN 978-0-253-11172-2. Retrieved 12 June 2013.